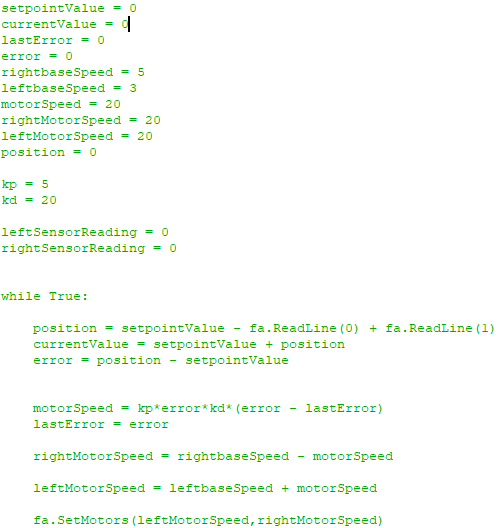 I'm trying to implement a PID based line follower. The robot has 2 line sensors with ranges from 0-200, with 0 being black and 200 being white. I'm trying to follow a black line. I'm struggling to get the robot to do anything but erratically turn and confuse itself on the spot, getting wildly out of control. I've tried adjusting the setpoint value, the operators in the equations and the kp/kd values to no avail. Usually one would also divide the error difference by the time that has passed, however this would only change the effective kd gain by a constant factor, assuming that the time between samples is constant. Also normally the error would defined as setpoint minus position, which effectively would multiply motorSpeed by minus one. Not the answer you're looking for? Browse other questions tagged sensors pid algorithm python line-following or ask your own question. What algorithm should I use for a line follower?